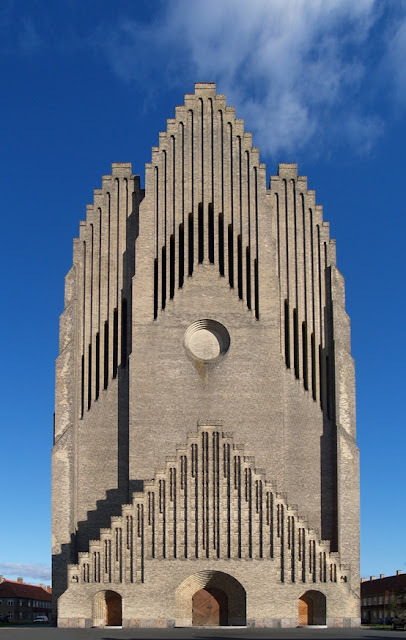 Grundtvig's Church is located in the Bispebjerg district of Copenhagen, Denmark. It is a rare example of expressionist church architecture. Due to its unusual appearance, it is one of the best known churches in the city. The most striking feature of the building is its west facade, reminiscent of a westwork or of the exterior of a church organ. It includes the 49 m (160 ft) tall bell tower. The imposing facade with its strong verticality guides one's eyes towards the sky. The bottom half of the tower is simple brick while the upper reaches present the appearance of one solid, rippling surface. Klint decorated the nave with a version of the stepped gables common on Danish churches, but reinterpreted by doubling the apex. The nave was designed with generous dimensions: The triple-aisled hall church is 76 m (259 ft) long in total and 35 m (115 ft) wide; the nave has a height of 22 m (72 ft).